For over 60 years, Tom Carnegie was the voice of the Indianapolis Motor Speedway. 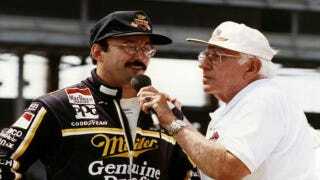 Seen here giving a post race interview, it was Carnegie's booming voice that announced every Indianapolis 500 race from 1946-2006. Although Carnegie's position as chief public address announcer meant he announced every event at the Speedway, it was the annual Indy 500 he will be best remembered for. His deep cry of "It's a new track record" will remain with many former Speedway racers and attendees forever, including some famous Indy stars.